Beliefs about fairies were not exclusive to the Celtic lands. Similar ideas have been held by neighbouring and even far distant peoples, either through contact or simply because there are some supernatural beliefs that all humans share, even without any direct line of communication. Australian boriginals for instance, cut off from the rest of humanity for thousands of years, nevertheless shared with the Chinese, Europeans and many others a conviction that the stars of the Pleiades had once been seven sisters. The legends vary in their details in different parts of the world but their essence is the same. So it is with faeries. Along with scarier beings such as vampires, witches and werewolves, people everywhere have believed in them in one form or another. What is special about Celtic faerie lore is that it is much more vividly documented than most, and widespread belief in the reality of fairies lingered much longer on the European Celtic fringe than in neighbouring cultures. 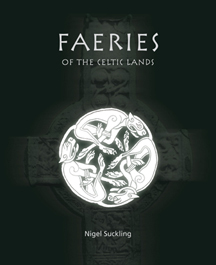 Nigel Suckling's erudite and entertaining text, accompanied by carefully selected illustrations, takes the reader on a tour of myth and legend, re-telling the key stories encompassing Celtic faerie myth from The Tuatha to the lingering beliefs of the present day, with enligtening, informative commentary.